It's been a long, long time coming but we finally have an official progress update on the Nintendo 3DS and Vita versions of Mighty No. 9 plus what's new on the physical backer rewards front. You can read the letter that was sent out to backers after the jump, but the gist of it is 3DS/Vita versions are due sometime this year and physical backer rewards will ship in a couple weeks. Or so they say. 1. Hand Held versions They are not being cancelled, we are still in the process of porting. The porting had to be put on hold for a while due to the other versions being delayed and the recent adjustment we had in comcept. However, everything is back on track now. The developer restarted the porting process in early May, and we estimate to release them within 2017 (it could be earlier, but it’s hard to estimate a more precise date at this point). We will update on this when we have more information. 2. Rest of the physical rewards They have been manufactured (most of them), and are getting ready to be shipped out in a couple of weeks. We estimate to ship everything out (with some reaching the backers) by mid-August 2017. Again, we are very sorry for the delay. Fangamer will be sending out emails to everyone (who is waiting for rewards) to confirm the physical address before the shipping. We will update when the email is out, and if you by some reason DID NOT get the email, please contact Fangamer at orders@fangamer.com so they can verify the information. 3. The “New Company” This is probably the biggest piece of news. As many of you may have heard, Akihiro Hino (LEVEL-5 CEO), and Keiji Inafune (comcept CEO) will be co-founding a new company “LEVEL5 comcept”. What does this mean, you ask? It means that Akihiro Hino, and Keiji Inafune will be teaming up to make new games!!! This does not affect Mighty No. 9 in any way, but who knows, maybe in the future Beck, and your favorite LEVEL-5 characters may be tagging along in new adventures? The possibilities are limitless here. That is all for this update. Hope we answered some of your questions/concerns with this update. We will try, and bring you the next update much sooner next time! It took a while but there you have it. Now we just have to wait and see if things will pan out on schedule. The very least we can hope for is Comcept (or should I say Level-5 Comcept) will keep an open-line of communication with backers this time. Internal adjustments or not, this blackout went on far longer than it needed to be. 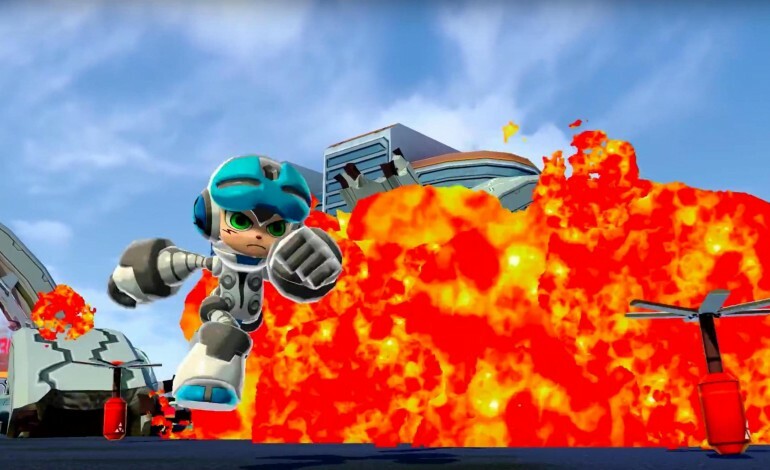 Imo this is a great opportunity for comcept with help from other devs to recreate mighty no.9 to be better as a portable game. At least I hope they will but I know how hopes and dreams go most of the time. was this decision made while MGVB was still being developed? Mighty Gunvolt Burst gets released, critics have claimed to be good and suddendly Comcept appears again. Coincidence? But at least is good yo finally get some closure. And hey, a crossover between MN9 and Inazuma Eleven would be the perfect spiritual successor to Mega Man's Soccer! Gotta love the image in this article, Protodude always salty and bitter until the end. Well, shut my mouth wide open. I mean, I'll believe it when I actually see it, but hey! An update isn't bad. At this point, they should just release Red Ash before coming up with anything new. Mighty No 9 and Kickstarter have pretty much messed up Comcept's reputation as is and they need to come up with a decent game in order to prove their point that they aren't just talk. I'm skeptical we'll get the rest of the rewards. We'll see. and while i would be as doubtful as the next guy reguarding comcept words, Lev.5 is usually tight good with comunication and it's public image so they'd avoid saying something and then not do it. n coincidence that comcept give news just after their acquisition. that's probably Lev.5 policy. that they give news now lead me to think even more of something i was suspecting. Keiji Inafune or comcept weren't trying to get out with the money or something. they just messed up big time. They got carried away with the popularity of the kickstarter, then the project ended up being a huge Gas-plant and they spent much more time and money than they thought they would. Then the game got very negative review, preventing it from being profitable (because obviousely they were excpecting the game to be rentable). They end up in poor financial state with still handled port to work on, and some backer to reward. thing get slow and messy and they don't comunicate because telling "Well we're not broke yet, but severly fissured, guys" is'nt a very reassuring thing to say and would have not made their reputation much better than letting angry backers insult them anyway. So they're acquired by level 5, who somehow refill the balloon. and they can get it together and get back to do what they promised. I don't say that this is much better or that there is someone else than them to blame if they failled. But that would mean they're just guys who failed, failed on some epic level, not a bunch of thieffy crook in league with the devil like They're sometime depicted. whatever i'm right or not, Level-5 will do something with them. you don't buy a company with a severly damaged public image just for the fun. they're probably already have plan. That's a really good way of looking at this situation. Never thought about it that way before. All I want to know is that are the 3DS/Vita versions just going to be straight ports or are they going to be remakes/updates? Because if they're just unedited ports, no one is really going to care. It will fix some of the goodwill; that Comcept is finally delivering on their promises. But no one is going to pay money for them if they have similar or worse issues. But I am being hopeful that someone good will come from this.